Once downloaded, setup a Guest OS (for which you can follow VM VirtualBox's provided instructions - installing Guest OS is not discussed here). VM does not provide usage of host drives/folders on Guest OS until they are explicitly shared. However, sharing host drives\folders might not be as simple as clicking and enabling sharing. It needs some steps before you can use host drives and folders (and surely all the files contained in them). The Guest can be any version of Microsoft Windows (98, XP, Vista, 7, etc.). I used Windows XP. Run your Host OS and launch VM VirtualBox. Start your Guest OS in which you want to share drives/folders and files contained in them. 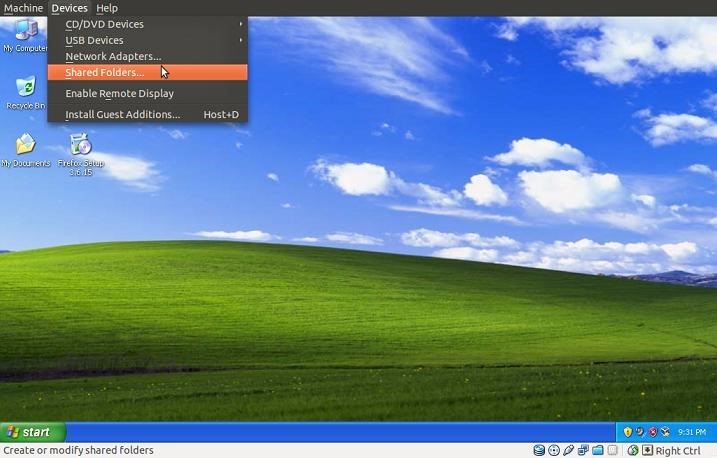 Click on "Devices" tab provided on the VM VirtualBox taskbar and select "Shared Folders" from the drop-down list. 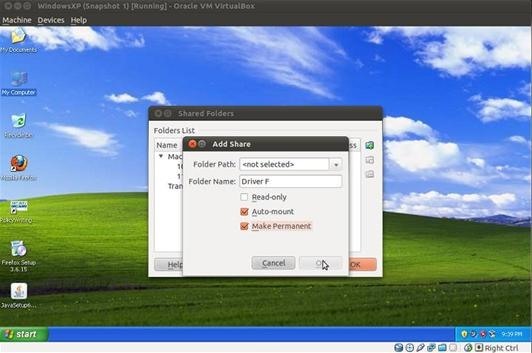 VirtualBox will open a window "Shared Folders". Click on the top icon in the right-hand corner to add the drive/folder. Another window will open—"Add Share". 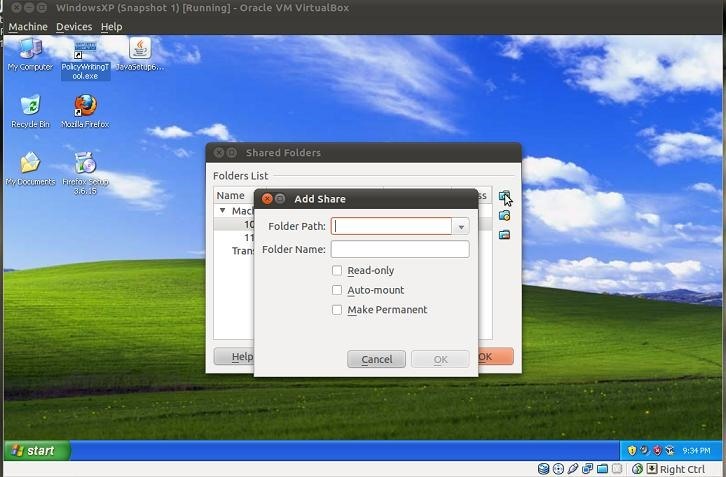 "Add Share" allows you to give the path of the drive/folder you wish to share from the Host OS by giving the path in "Folder Path". You can also browse the drive/folder from your Host OS if you don't remember the exact path of the contents you want to share. Now type the name of the folder in the "Folder Name" box. It can be any name you wish to have on Guest OS. Also, check the boxes "Auto Mount" and "Make Permanent" and click "OK". Go to "Start", select and click "Run" on Guest OS. Type "net use x: \\vboxsrv\Drive F" as the run command and click "OK". If you have done everything alright, then no message or notification will appear. Note that the shared drive/folder name should be the same as given in the "Share Folder" window from Step 6. I gave it "Drive F". Go to "My Computer" and there you will see your shared drive/folder under "Network Drives". Now you can access all contents contained in the shared drive/folder that you just shared. You can add as many drives and folders as you want following the same steps. 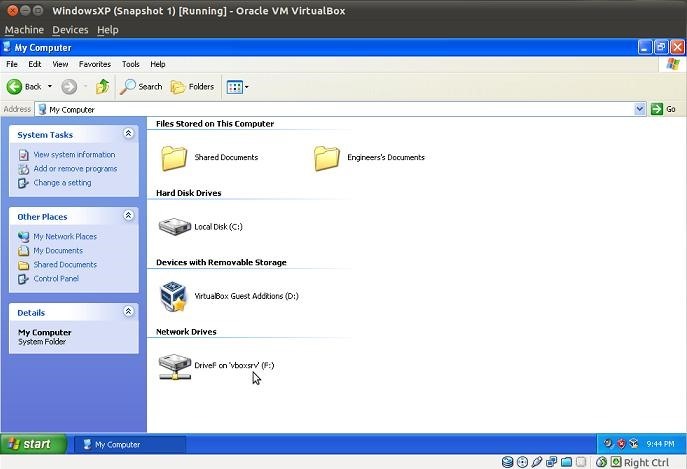 How to Share Local Drives and Folders using Oracle VM VirtualBox with a android OS? 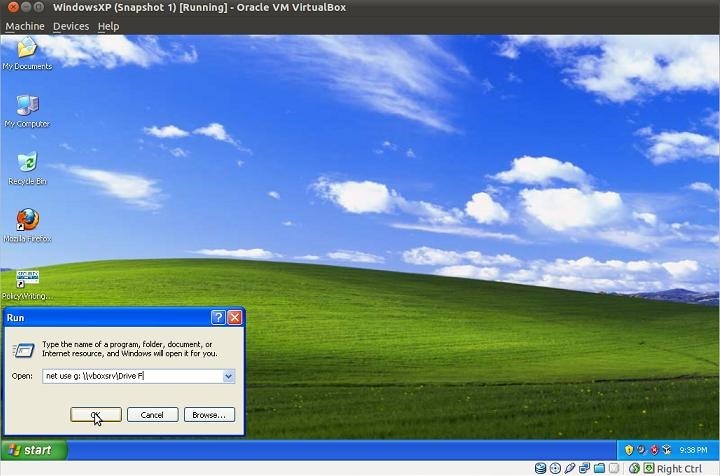 i am using windows xp as host os and windows 2000 as guest os in virtualbox i did with all the steps to share folder typing that command in run also worked but i dint find the network derives and when i searched for the shared folder it no such file found. the box will scroll instalation details. you will be asked twaise "un authoraised publisher" . click "Continue anyway"
you have to repeat this procedure when ever you instals a new drive ! I'm very new to this VM thing, and was struggling a bit as well in trying to get this shared drive working. (Host OS: Windows 8.1 on Surface Pro 3, guest OS: Windows 7). One important step I found missing (or not emphasised) in the steps above is the installation of VirtualBox Extension Pack. It's the prerequisite for shared drives to work. I'm confused with step #7. The bold writing says "net use x: \\vboxsrv\Drive F" but on the picture example you use "g" instead of "x". I tried "x", "g" and even "c", but none worked. The name of the Guest folder that I used is "DriveF" as VirtualBox didn't allow me to have a space in between.